I Ramya W/O Narayan, who is one of the medical staff and serving as a laboratory technician in Rajarajeshwari Nagar Bangalore. I have been doing many of the lab investigations & diagnosed many of the diseases and have been a moral support to my patients. But never expected this cruel twist in life. 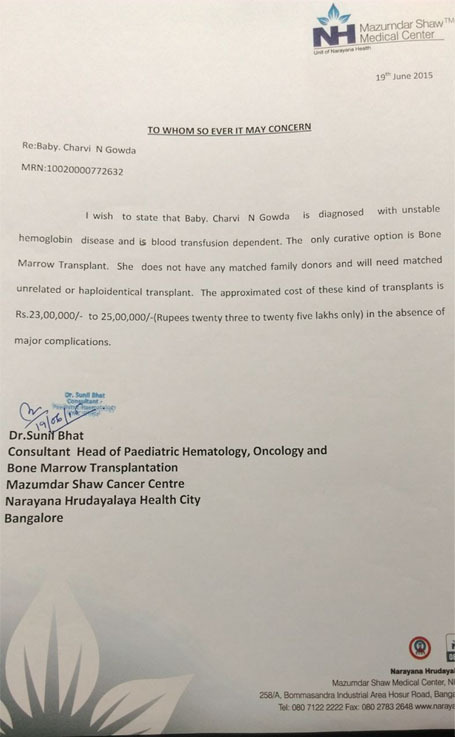 Now, my only daughter CHARVI N GOWDA aged 5yrs has been unfortunately diagnosed to be suffering from very rare condition called UNSTABLE HAEMOGLOBIN DISEASE and her life depends on the generous contributions, which would go a long way in funding her expensive treatment- an estimated Rs. 25 lakhs in the absence of the major complications. She is a student of Lalith Castle International School, RR Nagar. She is very much active and a bright kid and topper of the class. Here is a humble appeal by the family of Charvi, who needs moral and financial support to fight what the medical fraternity has termed as ‘RAREST OF RARE’ forms of HAEMOGLOBINOPATHIES. 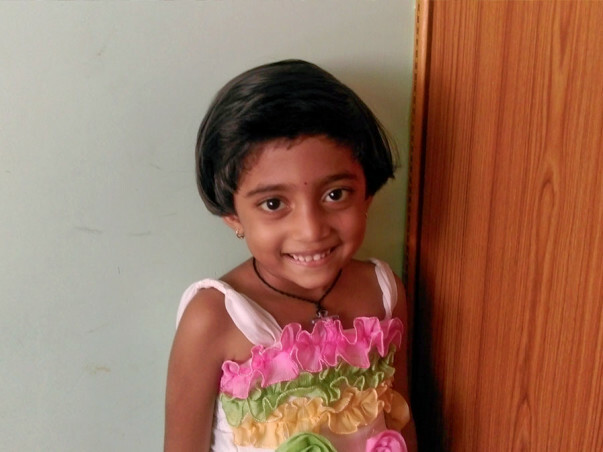 She has been treated from age of 3 months in Manipal Hospital by Pediatric Hematologist and was wrongly diagnosed as Hereditary Spherocytosis for which the simple treatment was splenectomy which was to be done after completion of 5yrs. In the month of Mar’15 she was admitted in St John’s Hospital in critical condition due to Intravascular Haemolysis under Pediatric Hematologist. Here the doctors ordered for higher investigations, as the findings did not match the previous diagnosis. So finally in the month of May’15 it was diagnosed as UNSTABLE HAEMOGLOBIN DISEASE. Here the Hemoglobin drops frequently as the life span of RBC’s will be around 20 – 30 days. Now, she is completely dependent on blood transfusions, which needs to done once in 30 – 45 days. Till now she has undergone 26 transfusions. As lifelong blood transfusions is associated with lot of risk factors, the only curative option suggested by Pediatric Hematologist is BONE MARROW TRANSPLANTATION. The procedure is planned to be done in NARAYAN HEALTH MAZUMDAR SHAW MEDICAL CENTER UNDER DR. SUNIL BHAT & DR. SHARATH DHAMODHAR. I have attached the estimation letter from the hospital below. As she doesn’t have any matching Family donor she will need matching unrelated donor or Haplo-identical transplant, which has to be done as early as possible for high success rate. The procedure is tentatively scheduled for the month of August 2015. Hailing from economically weaker background we are unable to arrange such a huge amount. The family has put in every available resource into the treatment and now is looking for philanthropists to contribute generously and all of your prayers to get well soon. Thank you all for your love and support. Your support has been truly overwhelming. Presently, she is doing really well. She does not need any medications anymore and is very happy right now. She is currently in her 3rd standard, at the Lalith Castle International School in Rajarajeshwari Nagar. 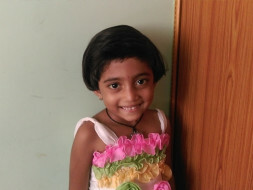 Charvi is doing good and is going to school. She is not receiving any treatment as of now. We take her for a follow up once a year. Thank you all for your wonderful love and support. Charvi is leading a healthy and normal life. This year on December 31st it will be three years since she underwent the transplant. She is going to school and goes for a consultation once in a year. She is not taking any medication as well.